A Joe Buck personal appearance, Joe Buck speaking engagement, or Joe Buck endorsement will reflect well on your company. To hire Joe Buck now for any corporate appearance, fundraiser, motivational speaker event, personal appearance, autograph signing, or website endorsement please contact our celebrity agents at 1-877-6-SPORTS. We will contact Joe Buck or contact Joe Buck's agent and provide you with the booking fees and availability immediately upon your request. Direct Sportslink is the only sports speakers bureau and talent booking agency based in the United States securing only sports talent for corporations, associations, and organizations for motivational speaking engagements, personal appearances, and endorsements. We are the premier sports celebrity booking agency and a sports celebrity procurement expert. Accordingly, we will provide you with any relevant Joe Buck website information and booking agent details so that you can hire Joe Buck for your next event. 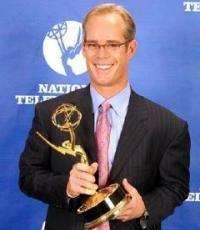 Joe Buck has earned the distinction as one of sports' premier play-by-play broadcasters, as evidenced by his four Emmy Award wins in 1999 and 2001-2003. Buck currently handles lead play-by-play duties for FOX Sports' Award winning NFL and MLB coverage, teaming with future Hall of Famer Troy Aikman and fellow Emmy Award-winner Cris Collinsworth while on assignment with the NFL on FOX, and three-time Emmy Award-winning analyst Tim McCarver while working out of the MLB on FOX booth. Buck is the first play-by-play announcer to handle lead MLB and NFL coverage in the same year since NBC's Curt Gowdy and ABC's Al Michaels. Buck began his play-by-play career in the NFL on FOX broadcast booth, where he worked from 1994-1997. He and NFL on FOX analyst Tim Green formed one of the network's original six NFL broadcast teams in 1994, when at age of 25, Buck was the youngest announcer to call a regular slate of NFL games on network television. 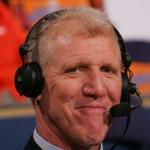 Buck has been a radio and television announcer for the St. Louis Cardinals since 1991. 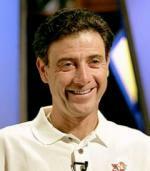 His broadcasting career began in 1989, while he was an undergraduate at Indiana University. That year he called play-by-play for the Louisville Redbirds of the American Association, a minor league affiliate of the Cardinals, and was a reporter for ESPN's coverage of the Triple-A All-Star Game. In addition to his current broadcasting work for FOX Sports, Buck also contributes occasional columns to The Sporting News. The son of broadcasting legend Jack Buck, he attended Indiana University, studying English and Telecommunications. He was born April 25, 1969, in St. Petersburg, Fla., the Cardinals spring training home, and was raised in St. Louis where he currently resides with his wife Ann, and their daughters Natalie and Trudy. In 2009, Buck gave a speech at the School of Journalism at his former college, Indiana University-Bloomington, which was filmed and subsequently aired on the Big Ten Network. Based on your interest in Joe Buck as a speaker or for a personal appearance, Direct Sportslink has provided you additional links below for other sports talent with similar appearance fees, speaker topics, and categories that match Joe Buck.